Just because someone doesn’t have a roof over their head doesn’t mean that head can’t be well-groomed, as one New York City stylist who usually commands upwards of $150 for his hair services is showing by providing free haircuts to those in need. 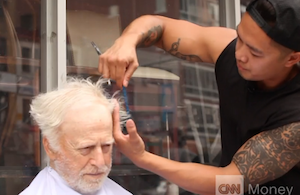 Every Sunday afternoon, the stylist takes the time to groom denizens of the city who are homeless or in otherwise not ideal situations, reports CNNMoney, instead of tending to his usual clients at a Chelsea salon. The stylist has been cutting hair since he was four years old, and started helping the needy with their grooming while visiting relatives in the Philippines in 2012. While there, he joined efforts with a local barber shop to give cuts to needy kids. “It made such a strong positive impact on me that I decided to bring it back home to NYC,” he said, estimating he’s given haircuts to more than 50 homeless people. He’s also handed out free cuts in Costa Rica, Jamaica and Los Angeles as well. Another man who’s been homeless for eight years got a buzzcut and his goatee trimmed, calling the stylist an “angel” for getting him ready to visit his daughter that night. Next Is There A Link Between The Size Of Your Wedding And The Quality Of Your Marriage? Next Up: Is There A Link Between The Size Of Your Wedding And The Quality Of Your Marriage?